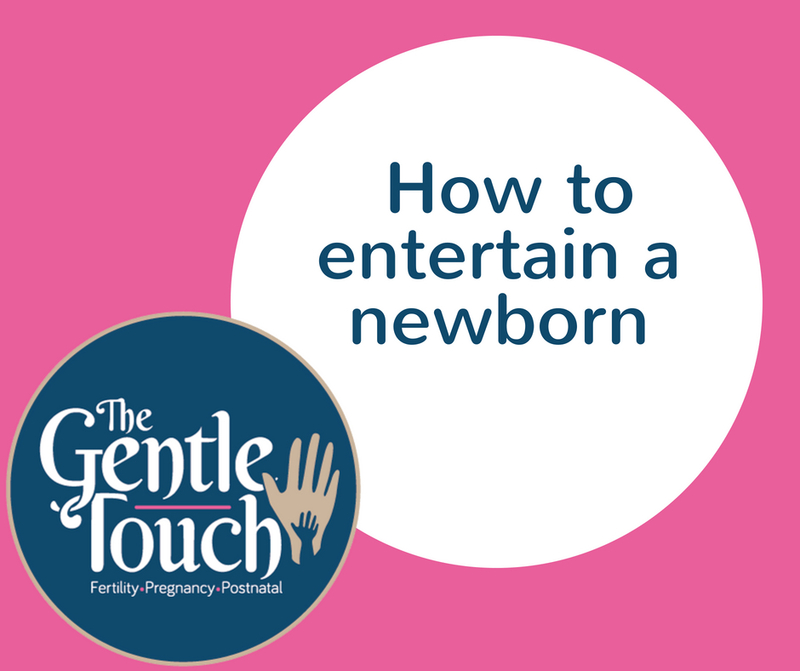 You might be wondering how to entertain your newborn baby. We live in a world full of interaction, with a fast pace of conversation, stimulated by tv and radio all the time. Perhaps you worry your baby is bored at home with you. Babies can experience boredom but the good news is we don’t have to do much to entertain them. In the first few months, just getting interaction from you and watching your daily life will often be enough to entertain your newborn. Small things like the shadows created by the sun streaming in the windows, or your movement of sweeping the floor provide entertainment in the early postnatal period. Turn them to face a new scene – babies can sit and watch you work around the home (e.g. doing the washing), but may need a different angle from time to time. Baby massage – gentle massage can calm you both and help you feel more connected. This may allow your baby to have a small time ‘apart’ from you as you build the connection when you are together. The time apart may only be them sitting in their own space for a short while, but for some babies that is enough separation during this early phase. Play together – make silly faces like sticking out your tongue, doing a surprised face. For babies aged around 3 months onwards peekaboo can help them learn you go away, and then come back. This may help with separation anxiety. Sing – you might not have the best voice, but babies do not care! They love to hear us sing so try the old classic nursery rhymes or just your favourite pop songs. Dancing – babies may enjoy being held closely in your arms and gentle swaying to some music. Depending on their age and personality babies may like more upbeat music and rhythm. Keep music and dancing for a short period of time, and err on the side of calm and quiet. Having music on in the background can overstimulate babies and they may feel stressed by the noise. Talking to them – as you wash up or put away your washing just chat to your baby, let them know you are there with them, and talk about what you’re doing, or what has happened that day. You may feel silly at first, but this conversation will let your baby know you are close by, and you are available for them. They will be watching you, trying to make sense of your language, your actions, and putting a picture together of daily life in the home. Avoid too much waving of toys in babies’ faces or fast, low activities that may scare them. You can entertain your newborn with small activities, keep it as slow, calm and quiet as you can at first, and only progress to more upbeat activities when your baby is old enough to manage the interactions without becoming overstimulated.